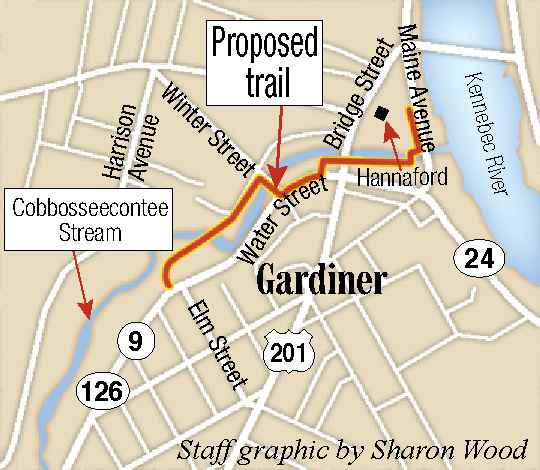 In conjunction with the pending redevelopment of two bridges in Gardiner, state transportation officials are seeking input from Gardiner-area residents on the extension of the Cobbossee Rail Trail through part of downtown Gardiner. The multi-use path will begin at the existing end of the Kennbebec River Rail Trail on the west side of Maine Avenue. Current plans call for the path to cross a new pedestrian bridge over Cobbosseecontee Stream and continue west across the Arcade parking lot and extend 50 feet past the Bridge Street bridge. It’s expected to be incorporated into the state’s plans to replace the Bridge Street bridge and the Maine Avenue bridge, which both cross Cobbosseecontee Stream near where it flows into the Kennebec River east of downtown Gardiner. When it’s done, it will give people like West Gardiner resident Sue Pierce another option for walking. Pierce said Tuesday she has walked on the rail trail in the past and she often walks in West Gardiner around the Helen Thompson School, or along the town’s roads. But in some places, particularly on High Street where it’s hilly, Pierce said she’s concerned about safety. When the Gardiner trail project is done, she said she looks forward to walking there, particularly if it offers shade. “Because of the timing, it made a lot of sense to coordinate with the Department of Transportation,” Patrick Wright, executive director of Gardiner Main Street, and Gardiner’s economic development coordinator, said. The project will be able to be bid out at the same time as the bridge replacement work, and the DOT will have the staff and resources to oversee the project, Wright said. When the project is completed, it will be owned by the city of Gardiner. This step has been a long time in the making. Nearly two decades ago, Gardiner residents identified building a trail along Cobbosseecontee Stream and redeveloping the Summer Street area as a priority of its downtown revitalization project. Over the next few years, city officials pulled together state funding and started to draft plans for a pedestrian and bicycle trail that would extend the Kennebec River Rail Trail. But with the start of the Great Recession and the contraction of the economy both nationally and across Maine that started a decade ago this month, those plans were shelved in favor of other more urgent projects, and the state funds were not spent. In 2016, though, Gardiner elected officials approved a city budget that included funding for the city’s 20 percent match of the state funds needed to move the project forward. The city was reaching the point where it would have to return the money and pay back what had already been spent on developing a conceptual design if officials did not move forward. 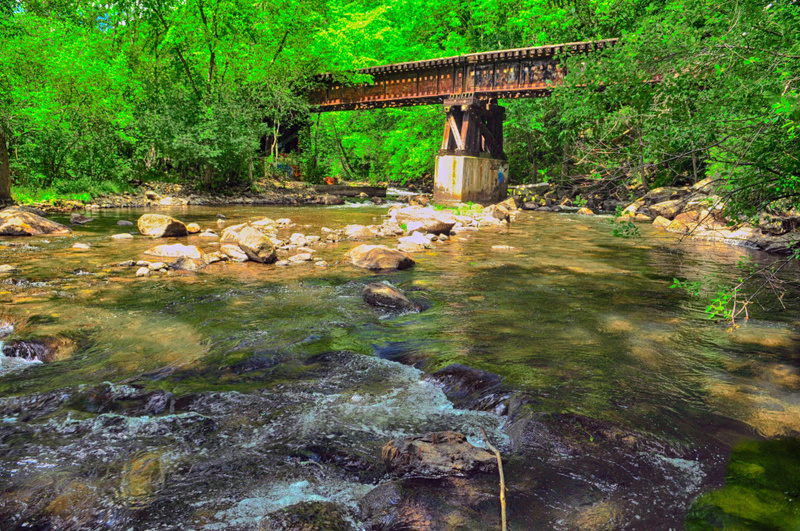 At the same time, Gardiner Main Street received a $50,000 grant from the Healthy People Healthy Places program to design the portion of the trail along a rail trestle. A meeting is scheduled for 6 p.m. Thursday in the gymnasium of the Boys and Girls Club of Kennebec Valley at 14 Pray St.